It was the launch we’d been waiting for for some time and some even dubbed it Apple’s biggest ever. And not just in terms of its size, but in terms of how much it meant to Apple in the face of its fiercest competition yet. And none come more fearsome than Samsung’s Galaxy S3. Launched in May and selling 20 million handsets in its first 100 days, it’s become the king of the Android handsets and propelled Samsung into the position of the top mobile phone manufacturer in the world. So how do the two stack up against each other? 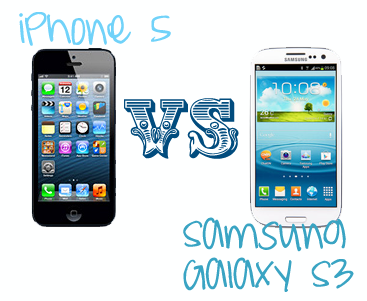 Here, we pit the new iPhone 5 against the Samsung Galaxy S3 in a head-to-head to see, specs-wise, which one comes out on top. The new iPhone has been dubbed “the thinnest and lightest yet” and that’s difficult to argue against, with Apple turning out a handset that’s slightly thinner than the S3 and one that’s much lighter. The iPhone 5 was rumoured to have a 4-inch screen and those were confounded, however expectations were that its width would grow with it, however that’s remained the same. This means that an extra row of apps can sit proudly on your homescreen while the thinking behind not changing the width was to aid one-handed use. This all measures in at 0.8-inches smaller than the Samsung Galaxy SIII and subsequently 21g lighter in the hand. At the time of publishing, exact specs of the A6 quad-core processor were being guarded, however we’re told that it will be twice as fast as the 4S with improved battery life but likely to clock in at 1GHz or just above. The Samsung Galaxy S3, on the other hand, has ARM’s beastly 1.4GHz Cortex-A9 processor, which cuts through Android 4.0 like a knife through butter. The big advantage the S3 has over the iPhone 5 here is that it offers expandable storage of up to 64GB. Until we’ve road-tested the iPhone 5, it’s still too early to tell its camera’s quality. The Galaxy S3’s camera is impressive and performs well in low-level light, at night and offers features such as burst shot and on-board editing. New to the iPhone 5 is a panorama feature, enabling you to shoot a scene of up to 240 degrees in one go. However this feature isn’t anything too groundbreaking and is available on a number of apps as well as on the S3. On the day the iPhone 5 was announced, it’s clearly too early to tell, but on paper the iPhone 5 offers similar specs to the Samsung Galaxy S3. However it’s not offering anything groundbreaking or particularly exciting to tempt consumers into switching. Apple devotees will love it and it will likely sell in its millions when it’s released on September 21, but will it sell as many as the S3? Only time will tell. Note that as soon as we’ve got the iPhone 5 in to test, we’ll update this blog. Compare the best iPhone 5 deals and Samsung Galaxy S3 deals with Mobilesplease. I have the SGIII & the iPhone 4s …by far I choose my SGIII. and with the iPhone 5 now out. I do not see much of a threat, it looks to me that Samsung is ahead in the game now and apple cannot stand it. I just love everything my SGIII does compared to my iPhone 4s. Why do I have both?? ?…Samsung is personal and I phone 4s is provided for work. Funny thing is I get more production done and use with my personal. Go figure, both phones but Samsung is oveall tops for me. 100 million S3s sold in 100 days? To date, the S3 has sold about 20 million units. Presumably, therefore, 80m dissatisfied customers have returned theirs!!! You probably mean 10 million in 100 days. Well noted Michael – it was a typo. 20 million sales have been made in 100 days – a link to ZDNet has been added as a source. I feel iPhone will lose. iPhone was = Steven Jobs, but now iPhone = ?